The XL size is meant for a talis and two pairs of tefillin. The large size is meant for a talis and one tefillin/or a siddur. This Product is available in a bag that says Teffilin, a Rashi & Rabbeinu Tam set, or a Double Teffilin Bag. 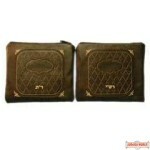 A double teffilin bag is an outer bag which is meant to have a Rashi & Rabbeinu Tam Bag set in it.